Laminators Inc. designs and manufacturers a beautiful suite of forward-looking products that make it easy to achieve standard as well as innovative applications. With over 50 years of experience, Laminators provides factory support from the design phase and throughout the life of the system, including expertise in constructability and code compliance. A polypropylene, corrugated core between finished aluminum sheets. Omega-Lite® panels are strong, water-resistant, non-absorbent, and easy to maintain. Class A fire rated and NFPA 285 approved for select Laminators installation systems. Smooth and stucco-embossed finishes. All the features of Omega-Lite® panels in a flexible panel. With its flexible backer, Omega-Flex™ panels are able to wrap a 10 foot to 17 foot radius. Perfect for curved surfaces, towers, and freeform structures. Durable and maintenance free; designed to reduce panel installation time. Create a traditional or high-tech appearance at an affordable cost. Both "H" and "Reveal H" moldings available. Combine various Laminators installation systems and moldings to create unique effects. Achieve the look of Rout and Return free of the hassle of prefabrication. This easy, cost-effective, proven installation method delivers a very flat look without visible fasteners. Use color-matched or contrasting caulk to achieve your design aesthetic. 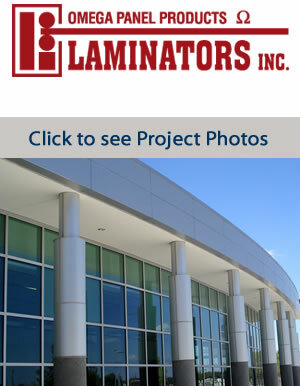 Achieve a sophisticated, high-tech look with Laminators Rout & Return installation system. Achieve excellent strength and a "deep reveal" look. Combine with other Laminators installation systems for a more economical total installed cost. Achieve a "deep reveal" aesthetic without caulk at the joints. Use Laminators dry seal with Omega-Lite® panels to create a high-performance wall system that allows for drainage and ventilation. Contact us today to discuss your project and discover whether Laminators is the right fit for your aesthetic.